When I try to process what we saw at Kentucky, I keep coming back to this image. Richt’s not aloof – his interview coming out of halftime was spot on. Defenders were out of their gaps, playing soft, and giving up back-breaking runs on third and long. But it’s another thing to get that across to the team. And surely they’ve been taught the proper gap assignments and run fits. Return men have been taught time and again the correct decisions when to field a punt or take a kickoff out of the endzone. If the message is clear – and these are largely veteran players who have heard it a time or two – it’s now either being tuned out by a bunch of guys who already know their likely draft status, or it’s being disregarded in the pursuit of personal glory. It’s a stretch to tie that back in with a single image like the one above, but who was going to get the rest of the team to match the focus of its quarterback? And what a game by Murray. He’ll surely hear the “big game” talk again this week, but there’s something to be said for taking your team on your back in any situation. His decisions were spot on, his execution was sharp, and you had faith in him to keep the Dawgs out front if the defense could just get a stop. His record-setting night would’ve been even bigger if not for a few costly drops. Georgia needed every bit of it because as good as they were in the passing game, they were that poor on the ground. If Richard Samuel’s play against the fake punt was the special teams highlight of the first half of the season, Connor Norman’s alert recovery of Kentucky’s onside kick is the clubhouse leader for the second half. Kentucky did a lot right on that play and blew up the Georgia players who usually would have recovered the kick. But while the kicker waited for the ball to roll its final yard, Norman came from near the sideline and dove at the feet of the kicker before Kentucky had a chance to pounce on the ball. You had to be a little nervous about Kentucky getting the ball back down less than a score after such a big momentum play, but the Wildcats wouldn’t get the ball back until the game’s waning seconds. Good job by the offense to kill those final few minutes and remove the defense as a factor in the game’s outcome. Against Tennessee the Dawgs couldn’t put the game away with the offense, and the defense had to create three late turnovers. At Kentucky a second down pass to Marlon Brown gave Georgia a first down and got them going on a drive that ate up all but a few seconds of the last four minutes. Ken Malcome did his part by moving the chains with a few nice runs. The coaches also made a very smart call on the 4th down Murray bootleg at the end of the game. Mississippi State faced the same situation a week ago, and we talked about their decision. Georgia didn’t get points there – Lynch has to make that catch – but the decision to run a play rather than kick was the correct one. Watching Murray on that bootleg couldn’t help but make me wonder why we don’t see his mobility more often. Certainly the coaches are protecting him to some extent, and he takes enough hits on traditional pass plays. They’re not going to stick him out there like Connor Shaw, but Murray is no less capable running the ball. If the line is going to be an issue, rolling Murray out should be an option. Going back to Samuel, Georgia continues to miss production from the fullback position. If that’s going to happen, the blocking had better be something special, and it hasn’t been. If Samuel (or even Malcome) can’t get a shot, is it time to see what the freshman Hicks can do? And has Zander Ogletree played his last down? I don’t know if it was too-cute gamesmanship or a genuine issue, but I lost count of the number of times receivers, especially Brown, held their hands up as if they didn’t get their assignment while the play call came in from the sideline. That was a minor issue, because it was a very good night for the receivers. There were drops, sure. I like this group even with Bennett out of action. My favorite play of the night might’ve been on a fourth quarter scoring drive. King, already with a great game under his belt, executed a textbook block on the edge for Marlon Brown. Brown, meanwhile, got his initial yards and showed his strength as he shed a tackler and fought for four or five more yards. Great example of senior receivers working together to get nearly ten yards from a play that could’ve easily gone for no gain. And great to see Conley back in the endzone. He made a significant play in Jacksonville last year and will hopefully come up big again this week. Collin Barber has had some Oscar-worthy moments trying to draw a flag, but the penalty he drew in the early fourth quarter was legitimate. And what a big turning point. Georgia ended up turning that penalty into their final points of the night. Georgia’s at a tough spot going forward at defensive end. Abry Jones, if he can go at all, is hobbled with an ankle injury. Washington continues to struggle with containment and penetration as a converted OLB. The defense needs Garrison Smith to step up as well as he did at Tech last year and for younger guys like Ray Drew to embrace the “next man up” mentality. It’s amazing how quickly an overpursing and soft defense can have you skipping right over the Martinez era and reaching for Kevin Ramsey comparisons. The same undisciplined play that saw Kentucky gash Georgia on several third-and-long runs also showed up in penalties. Georgia was flagged eight times, including several false starts, two completely unnecessary personal fouls, and a facemask. The Dawgs were also flagged both times they attempted trick plays. Both plays were executed well, but a fake punt was whistled for an illegal formation, and a direct snap to Marshall was attempted with two men in motion. The plays seemed to be sound, but if you’re not nailing down basics like gap assignments, special teams, and offensive line play during the bye week, can you expect sharp attention to detail on a trick play? In fairness, though, I’m having a tough time seeing the penalty on either of those plays. Murray was the only man in motion on the direct snap, and the only way you could call an illegal formation on the fake punt is if you claim that Lynch, at “quarterback” lined up so tight as to be considered part of the line. You learn something new every game, and now we know that David Bowie is a redshirt freshman defensive back for the Dawgs. Spot on! I couldn’t have said it better myself, so I won’t except to say that I have seen and coached (26 years) a lot of football and I have NEVER seen a group with this much talent play so terrible on defense. They have played one complete game: Vanderbilt. 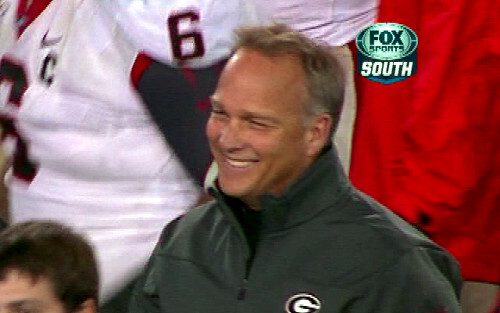 I have read several negative comments about Richt smiling at half-time. I was wondering, do you think he may have been using a psychological ploy? Maybe he was just trying to lighten the mood of a struggling team on the road. Over the last few seasons Richt has been criticized for his calm demeanor, needing more fire, etc. But that calm demeanor was fine the first 5 seasons or so. Fans seemed to comment that his cool-under-fire attitude helped the team pull out some tough wins. Now that same attitude is a detriment to the team? I don’t get that. What baffles me is how does a top 5 defense from a year ago go to being mediocre with basically the same players, coaches, and schemes? I thought the first couple of games were just aberrations; but now it seems to be a trend. On a different note: I am with you on the two penalties on the trick plays. The only thing I saw on the motion penalty was Marshall appeared to step slightly to his left just as the ball was snapped. If Murray was still in motion, then I guess technically there were two men in motion. Both receivers on the right side were waving their arms just prior to the snap. I am guessing that was to confuse the defense into thinking they did not know what was going on and an attempt to catch the D flat-footed. On the fake punt, I am not sure what the problem was there. On the replay it appeared there were 8 men on the line and 3 in the backfield. I did not think that was a penalty for illegal formation. Richt commented on another blog I read that Vavlas was on the line and was covered up by the outside guy. That, as far as I understand it, is only a penalty on a pass play and only if the covered receiver goes out for a pass. Then it is ineligible receiver, not illegal formation. Well, anyway, in a way I am sort-of glad we did not just blow UK out of the stadium and UF really spanked USCe. It may have a psychological effect on both teams; UF feeling overconfident and UGA knowing they have to be sharp in all phases to pull out the W. Then again, when was the last time UGA was sharp in all phases in a big game? This is obviously the biggest game of the season for several reasons. Thanks for the blog. I enjoyed the read.